Many home warranties are backed by the builder, while others are purchased by builders from independent companies that assume responsibility for specific claims. In other cases, homeowners purchase coverage from a third-party warranty company to supplement coverage provided by their builder. In fact, the Federal Housing Authority (FHA) and the Department of Veterans’ Affairs (VA) require builders to purchase a third-party warranty as a way to protect buyers of newly built homes with FHA or VA loans. Most warranties for newly constructed homes offer limited coverage on workmanship and materials as they relate to components of the home, such as windows, siding, doors, roofs or plumbing, electrical and HVAC systems. Warranties typically provide coverage for one to two years, although the specific time period may vary by from component to component; coverage may last up to a decade on major structural elements. Warranties also routinely define how repairs will be made and by whom. What’s the process or timeliness if I have a claim? Is it possible for me to dispute your decision to deny a claim? Can you refer me to other new home owners with whom you’ve worked so I can speak to them about warranty coverages? The information you gain may not be enough to send you running from your new home deal, but it should help you understand where you’ll stand if you ever need to file a claim. You should also check with your state’s Attorney General Office or contractor licensing board to make certain your builder is offering all warranties he’s required to provide. Originally published June 11, 2014. Trained to spot financial mismanagement, mortgage lenders take careful time to review your finances before approving or denying you for a home loan. The role of the lender in approving a loan is to make sure you have enough money for a down payment and closing costs, and to assess whether you’re able to regularly make your monthly payments. Part of how they do that is by reviewing your bank statements. That’s why it’s important to make sure all your documents and records are sorted and straightforward. Lenders typically include your last two months of bank statements in their evaluation of your finances. Having a long list of overdraft charges in your account isn’t the best indicator that you’ll be a good borrower. No matter the circumstances, having a history of overdrafts or insufficient funds noted on your statement shows the lender that you might struggle at managing your finances. Another red flag to lenders is when a bank statement has irregular or lump-sum deposits. This can be seen as iffy because it could appear that those funds are coming from an illegal or unacceptable source. Unless you can provide an acceptable explanation for your large deposit, it’s likely the lender will disregard those funds and apply your remaining dollars to their assessment of whether you qualify for a loan. One way to help ensure that your bank statement won’t raise any red flags with lenders is by having consistent, tracked payments. If, for instance, you have automatic monthly payments to an individual rather than to a bank, lenders could see that as a non-disclosed credit account. This would be the case if you were to take out a loan from your parents and make car payments to them rather than an actual bank, for example. Take extra care of your transactions for at least a few months before applying for a mortgage. Lenders want to know that the money in your account has been there for some time, not just recently deposited. One or two big deposits into your account right before applying could indicate to lenders that the money you claim to have isn’t actually yours or isn’t a “seasoned” asset, meaning the money hasn’t been in your account for at least two months. At the end of the day, it’s best to start the process of organizing your bank activity and statements prior to applying for a loan. 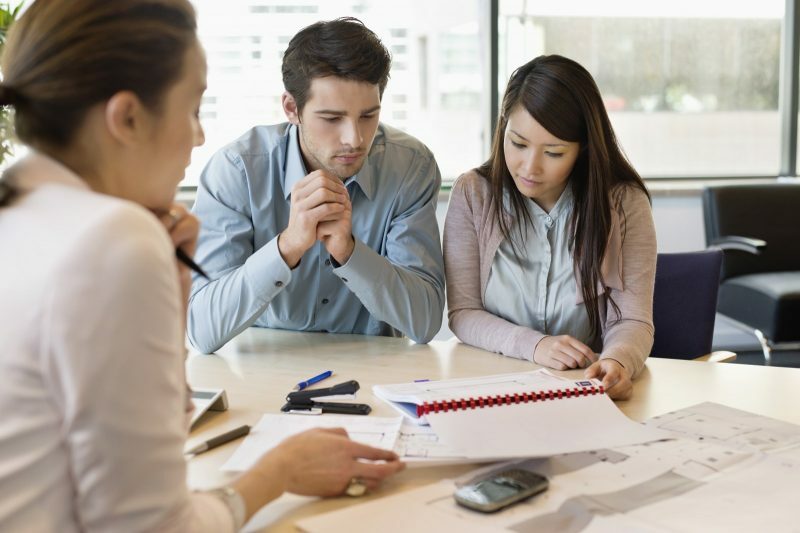 When you start looking for a home, it’s best to have your financial information sorted in case your dream home hits the market and you have to move fast. If you keep your bank statements top of mind in the initial search phases, you may have an easier time applying for a loan and ultimately securing it. Remember: Underwriters review your accounts once more, just prior to closing. So, be sure to maintain healthy finances throughout the closing process too. How Do Co-Borrowers’ Credit Scores Affect a Home Purchase? Whether you’re a seasoned or first-time home buyer, be prepared to know your FICO score and have a firm understanding of your credit history. And if you’re buying with another person, their credit history can affect your joint home purchase. First things first – what’s a FICO score and why does it matter? FICO is an acronym for the Fair Isaac Corporation, the company that developed the most commonly used credit scoring system. Everyone is assigned a number ranging from 300 to 850. The number assesses your credit worthiness through previous payment history, current debt, length of credit history, types of credit and new credit. For the purpose of buying a home or obtaining a loan, it’s the score most commonly used by lenders to determine the borrower’s level of risk. Many people simply refer to the FICO score as “credit score,” so we’ll do that moving forward. Which score do lenders look at? Typically, your lender will look at three credit scores reported from each of the three credit bureaus – Experian, TransUnion and Equifax – and then take the median score of the three for your application. Borrowers should hope for at least a 680, which is generally the minimum score for getting approved for conventional loans. For borrowers with lower credit scores, FHA loans allow a 580 score, or even as low as 500 if a 10 percent down payment is made. In any case, the higher the score, the better interest rate you’ll be offered. Should I apply with my spouse or alone? Deciding whether or not to include a spouse or a co-borrower on a mortgage application often comes down to whether it makes the most financial sense. There’s not a ton of wiggle room when it comes to qualifying for a loan. You typically qualify or you don’t. If the only way you can qualify for the loan is by applying jointly to include the total income of both borrowers, then that might be your only option. But even if your credit and income are good enough to qualify for a loan on your own, applying together still might be a better option, as each scenario has its tradeoffs. When applying jointly, lenders use the lowest credit score of the two borrowers. So, if your median score is a 780 but your partner’s is a 620, lenders will base interest rates off that lower score. This is when it might make more sense to apply on your own. The downside in applying alone, however, limits you to just your income and not the combined amount from you and your partner. While your credit score might be better, having a lender evaluate you on only your income could lower the total loan amount you qualify for. If having your name on the home is a big deal, don’t worry. You can still be on the title of the home, just not on the mortgage. If you decide only one name on the mortgage makes the most sense, but you’re concerned about your share of ownership of the home, don’t worry. Both names can be on the title of the home without being on the mortgage. 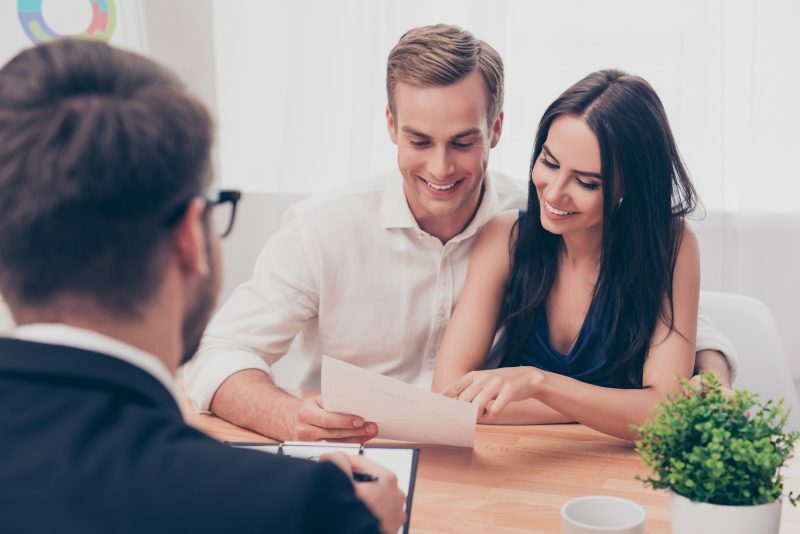 Generally, it’s best to add a spouse or partner to the title of the home at the time of closing if you want to avoid extra steps and potential hassle. Your lender could refuse to allow you to add another person – many mortgages have a clause requiring a mortgage to be paid in full if you want to make changes. On the bright side, some lenders may waive it to add a family member. 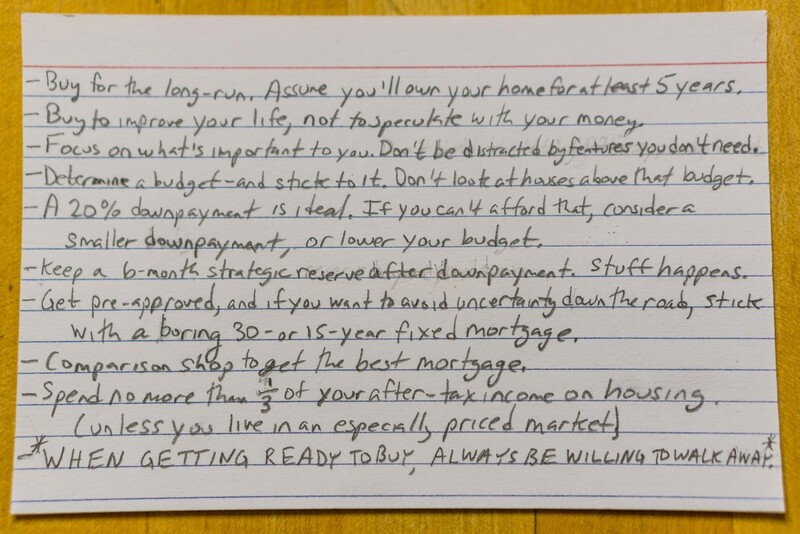 Now, following up on my original index card, I’ve written a guide on buying a house. Below is the housing index card – a handy resource to print out and take with you as you look at houses or think about buying one, plus some additional advice as you contemplate making the big decision. Some are even staying for the long haul. Almost half (46 percent) of all homeowners are like me – living in the first home we ever purchased. 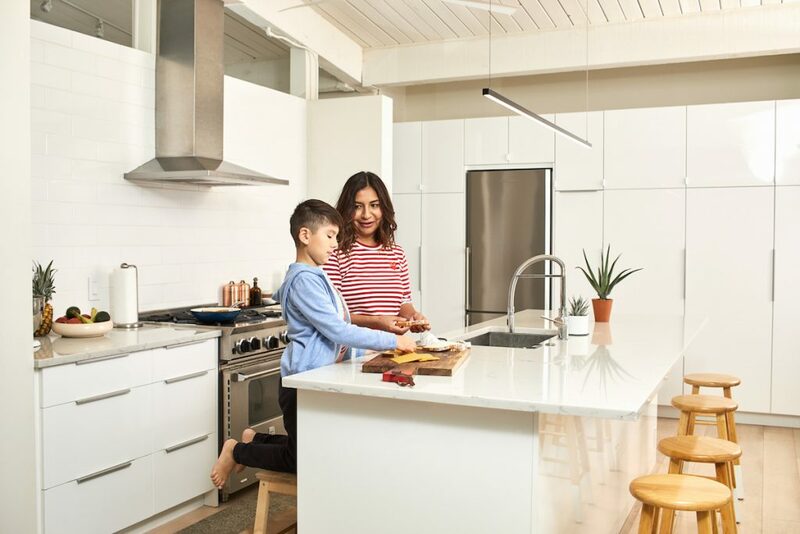 In short: Buy a home you want to live in – one equipped (or ready to be equipped) with the features and space you need, both now and in the future. Your home is more than a financial investment; it’s where you sleep, eat, host friends, raise your children – it’s where your life happens. So, focus on finding a home you can afford that meets your needs – but don’t get distracted by shiny features that might break your budget. Nice-to-have features often drive up the price tag for things you don’t particularly value once the initial enjoyment wears off. It’s important to set a budget early – ideally before you even start looking at homes. In today’s market, especially in the more competitive markets, it’s incredibly easy to go over budget – 29 percent of buyers who purchased last year did. There’s nothing inherently wrong with that. Local schools matter, and psychologists tell us that a short commute improves your life. But be realistic about your local market and about yourself. Know what you’re willing to compromise on – be it less square footage, home repairs or a different neighborhood. Buyers who don’t put a full 20 percent down pay a premium, most commonly in the form of private mortgage insurance (PMI). This is less financially punishing than it used to be, given today’s low mortgage rates. A monthly mortgage payment (with PMI) may be lower than a monthly rental payment in many markets – but still. The pre-approval process requires organizing all your paperwork; documenting your income, debt and credit; and understanding all the loan options available to you. It’s a bit of a pain, but it saves time later. Pre-approval also shows sellers that you’re a reliable buyer with a strong financial footing. Most importantly, it helps you understand what you can afford. I certainly didn’t. This did save me some annoying phone calls and hassle, but it cost me $40 or $50 every month, for years. The difference of half a percentage point in your mortgage rate can add up to thousands of dollars over the lifetime of the loan. It’s important to evaluate all the available options to make sure you’re going with the lender who meets your needs – not just the first one you contact. Buying a home is a time-consuming, stressful but ultimately rewarding endeavor – if you end up closing on a home that meets your needs. But it’s important to manage your expectations in case you don’t immediately find a home you can afford with the features you need. Why Is 20% Ideal for a Down Payment? Employment history and income are two of the biggest factors lenders look at when evaluating a mortgage application. A new job may be a good career move, but if you plan to buy a home in 2018, know that it can be a red flag to some underwriters – especially if you’re moving to a different industry. If you do get a new job while home shopping, let your lender know as soon as possible. It doesn’t mean you won’t qualify for a mortgage – just be prepared to show extra documentation. Avoid taking on large amounts of debt – whether it’s buying a car or planning a large vacation – before buying a house, even if you’re already preapproved. Take advantage of online tools and resources, like our affordability calculator, which can help you determine how much home you can afford. Our mortgage calculator can also provide custom down payment estimates based on home price and interest rates. And as you search for your future home, check out our extensive lender and agent reviews, which can help you find the best real estate partners for your needs.